We have recently tested the JBL Creature 2.1 acoustic system which proved to be a very good solution in its class. Note that Harman Multimedia produces PC acoustic systems under the Harman trade mark as well. Today we are going to examine one of models of this trade mark, namely harman/kardon Elegant 2.1 system. The User Guide is written in 5 languages and covers a list of technical characteristics and illustrated instructions for assembling the system. The name Elegant matches the design of the satellites in every aspect. Thanks to the thin stem and original support the satellites look especially exquisite. They bend a little backward following a tilted LCD panel or a notebook. The design is the main peculiarity of this model. The satellites use two identical loudspeakers. The high-frequency dynamic loudspeaker used in the satellites is of the Odyssey type. The cone made of aluminum foil is 3 cm in diameter. The flexible corrugation is made of foamed polymer. We could see such speakers in the JBL Creature, which however has more advanced loudspeakers - Odyssey plus. The sound noticeably differs; it depends on how rigid the flexible corrugation is. The Odyssey loudspeakers of the harman/kardon Elegant have a more rigid corrugation. The satellites are plastic. Their supports are made of metallic alloy. They have a rubber pad underneath which hold them steadily on lacquered surfaces. The satellites measure 9 x 22 x 8 cm. The cable connecting them with the subwoofer is 3m long. Above one of the satellites is general volume control. The buttons look like rubber pads. Both satellites also have a power indicator. The second satellite has two decorative rubber pads for symmetry. The subwoofer looks original though its design does not match that of the satellites. However, some may like it. 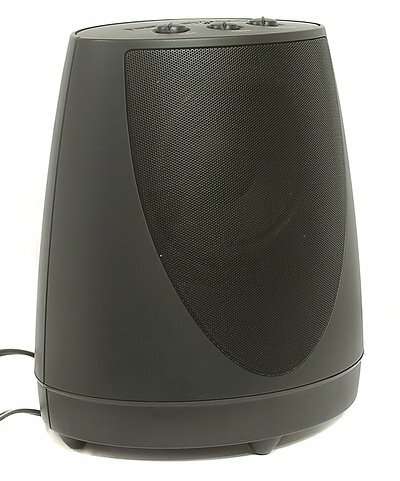 The subwoofer is made of plastic. It has the phase-inverter acoustic scheme. Its hole faces downwards. The LF loudspeaker's cone is paper; its diameter makes 13 cm. The flexible corrugation is made of foamed polymer. The sub measures 22 x 26 x 18 cm. It stands on 4 1.5cm legs which have rubber pads underneath. 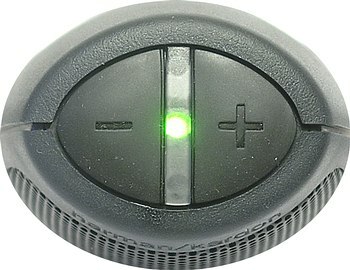 The sub has three controls and a power LED above. 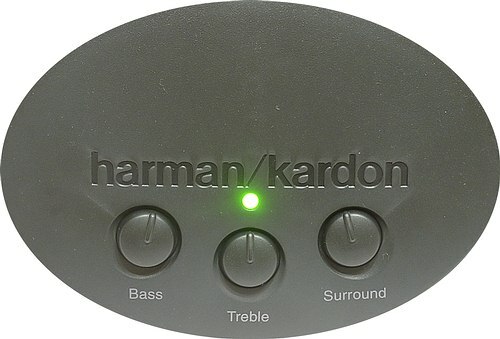 The Bass and Treble controls adjust low and high frequencies, and the Surround control adds a reverb effect. The sound quality doesn't suffer much, though you'd better listen to music without this effect. As you can see, the line-in is replaced with a 3m cable with two mini-jacks on the end. One of them has a rubber cap. When one of the connectors is inserted into the DIAG, a sinusoid signal of 40 Hz to 400 Hz is applied separately to the loft or right channel. The manufacturer thus rescues service centers from users' silly questions on operability of the speakers. 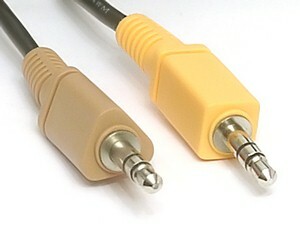 The connectors differ in color. Also, you can't insert the right satellite into the connector of the left one. If you look attentively at the back panel, you will see a square around the right satellite and a triangle around the left one. The connectors on the cables have respective profiles. The audio signal is reproduced by the Creative Audigy2 Platinum sound card. In general, the sound quality of the harman/kardon Elegant is unimpressive. We were not excited when listened to it in comparison with the JBL Creature. Moreover, I'm even a little disappointed. The sound quality reminds most inexpensive PC speakers out there. The highs and upper mids are blurred. They should be sharper and more detailed. What causes it is not clear. But it's absolutely right that the dynamic loudspeakers are worse than those of the JBL Creature 2.1 system. The JBL Creature had perfect stereo panorama. Although the satellites of the harman/kardon Elegant use two loudspeakers each, the stereo panorama is inferior to the JBL's model. The subwoofer's sound is actually similar to that of the satellites. No distortions are heard at a low volume level. But the lower frequency level is lacking. Many bass parts sound dimmish. The harman/kardon Elegant acoustic system has an excellent design but its sound is not that good. But it corresponds to its acoustic class. On the other hand, the previous system - JBL Creature - showed that it's possible to reach more with such an original design and small dimensions. 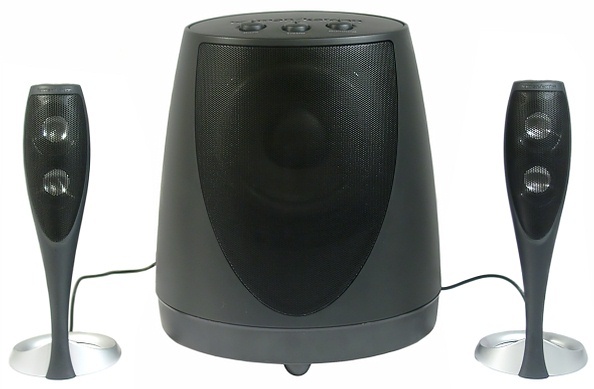 In general, the Elegant speakers can be a good solution for listening to music in the background mode. The sound won't tire your ears, and such an exquisite design will make you feel good.